table yesterday and I wanted to have it ready for you on Monday morning. I just love watching Masterpiece ~ Downton Abbey. And I love the sisters. I also bought the scone mix I featured HERE and made these delicious scones. has a large lemon tree and I have been busy making lemon curd. over 8 feet tall and more than 45 years old. Lemon curd and Strawberry jam from France. The three sisters are so beautiful. and drinking tea in a small tea room in the English countryside. One more look at the ladies before we say good-bye. What a gorgeous setting...the sisters would be right at home. I love the fun tea towel! I have some Downton teas too...some I like, some I don't. Your scones turned out beautifully! How nice to have a lemon tree close for fresh lemon curd. Such pretty teacups, and I LOVE camellias! Thanks so much for linking to Tuesday Cuppa Tea! I loooove Downton Abbey! Although, frankly the first few episodes of this season were boring to me. Your tea party looks like fun! I love having currants in my scones too! I need to catch up on episodes of Downton! Sweet setting. The scones look delicious! Thank you for sharing at Table It! Betty, I love your pretty teacups and the container of tea with the three sisters. I do love that show! Your scones look wonderful spotted with the currants and fresh lemon curd; yum! The tea towel is adorable and I like Mary's quote. Your camellias are heavenly and such a gorgeous colour! I really enjoyed your post and thank you for sharing it with us. What a lovely tea and yummy scones! What an absolutely lovely tea time. I think it's just perfect. Sure wish I could be there with you - everything looks so delicious and beautiful! I cannot believe last night's episode, wow. Won't say anything else in case peeps are just now trying to catch up - but WOW. Thank you for a lovely teatime today! 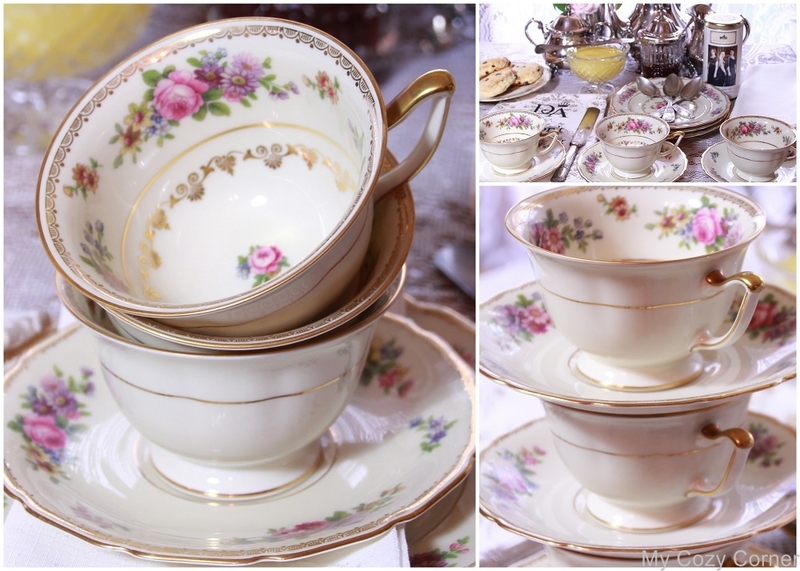 Your elegant tea setting is worthy of the Dowager! I'm also a DA fan and wish that there were more DA teas available north of the border. I managed to find the English Rose Tea at a local store last year and quite enjoyed the herbal tea. Such a beautiful tea table! I wish we got Downtown Abbey on my cable network to watch, the way everyone talks it sounds like it's an amazing show. Your table is just beautiful! Thanks so much for linking up at the Table It Link Party. I love your Downton Abby tea-scape. Do you like the tea? I've seen it in several different places and haven't bought any yet. I have an over abundance of tea, but it sure is tempting! I'll be so sad when the show comes to an end. Meanwhile, I will enjoy. Your china is lovely and just the talk of lemon curd makes my mouth water! Happy Tea Day! This is just beautiful! The scones look so delicious! The teacups are so pretty! Thanks for sharing! I am probably the only woman who has never watched that show. I know it wouldn't be "me." A lovely tea table and homemade lemon curd, wish I could join you. What will we watch when DA is finished? Have you tried Grandchester? It's pretty good. I loved your post and I have to say I missed my first time every Downtown on TV for a good reason. We closed on our retirement house in Missouri Friday and are 1/2 moved. Tomorrow we drive back to Colorado to do more work and packing. Our neighbor their told us there was `12" of snow. Ha! I loved your setting with homemade lemon curd. Beautiful cups and saucers and scones! Thanks for sharing. How pretty! We're all going to miss Downton Abbey when it's gone. It's been part of our lives for six winters! You've captured the charm, elegance, and mood of tea at Downton. I love this so much! We stayed up late last night to watch all the rest of season #6. (We have all the DVD's) I am letting you know that this post was one of the featured ones on my blog today. Thank you for sharing and congratultions. Your tea time is just beautiful! Love the camellia's too. They are way ahead of mine. Featured today at HSH! Thanks for sharing! It's beautiful! Hello, I came over from Home Sweet Home. Your pictures are just beautiful. I got to help with and attend a Downton Abbey Tea last Saturday. I hope to post some pictures in the near feature. My friend made homemade lemon curd, too. It was so delicious. I found a wonderful scone recipe and have made them at least 7 times in the last few weeks. I have really enjoyed getting in the spirit of Downton Abbey. I was tickled that I knew that was a Pink Perfection camellia in your pictures. My great aunt had a couple of bushes in her yard (they are still there-now my brother's home).